Case Results - Thompson & Pureza, P.A. The law firm of Thompson & Pureza represents clients in all types of litigation matters including cases involving automobile accidents, collisions and wrecks; premises liability claims, including slip and falls, deck and rail failures, trip and falls; medical malpractice and medical negligence cases resulting in permanent injury and death; commercial fraud, unfair business practices; workers' compensation; wrongful death claims; and disability claims. The following is only a small number of the types of cases we have successfully handled over thirty-three years. Drunk Driver Rear End Collision: $600,000 - We represented a young man who was permanently and severely injured when the car he was riding in was struck from the rear. The driver of the other vehicle was intoxicated and was traveling in excess of 80 mph at the time of the collision. After trial in the United States District Court, the jury returned a verdict for $600,000. We were able to collect from both the drivers' insurance companies, the underinsurance policy covering the car our client was riding in and his own policy. Moped Accident on Highway - We represented a young man who was struck by another motorist while driving a moped on the highway. It was approximately 12:00 midnight, when a motorist drove up behind him and struck the moped which caused our client to flip onto the hood, then onto the roof of the car where he subsequently rolled off. He suffered multiple head injuries and permanent disability. We successfully brought a claim against the driver of the vehicle and made a full recovery under the liability insurance policy. Tractor Trailer Truck Accident Causing Severe Neck Injuries - We represented a young lady whose vehicle was struck in the rear by a tractor trailer truck. Her injuries caused her to undergo multiple vertebrae fusions in her neck. The result of the surgery caused her to have difficulty swallowing, drinking, eating, speaking and caused her to have problems with her voice. She had been a remarkable singer and had sung in her church choir her whole life. After this accident she could no longer perform. After mediation, we were able to settle the case against the trucking company for a substantial sum. Head on Collision in Elizabeth City, NC - We represented a married couple who were hit head on while returning to their home in Elizabeth City one afternoon. The wife was hospitalized for several months with severe internal injuries. Her husband also suffered severe injuries. We brought a claim against the driver of the other vehicle and a claim against our clients' own insurance policy under the under-insured provision of their auto policy. We made a full recovery under all the policies. Police Pursuit - We represented a lady who suffered severe and permanent injuries when her vehicle was struck by a police car which was allegedly pursuing a speeding vehicle outside the city limits. The policeman tried to pass our client at a high speed without its blue light or siren activated. The police department claimed the doctrine of sovereign immunity, which is generally allowed in North Carolina to police officers in pursuit of law violators. However, we were successful in resolving this case on behalf of our client after significant discovery and depositions of the former chief of police, police officers and all the witnesses. We had strong evidence that the police officer was not pursuing a speeding vehicle but was trying to impress a civilian who happened to be in the car with him. Drunk Driver Kills 4 in Dare County - Four teenage girls were killed when their car was struck by a drunk driver in Dare County. We represented the family of one of the girls in the car in this dram shop claim. We brought a suit against the driver and the two bars where the driver had been drinking earlier that day. We were able to recover from the drunk drivers insurance company and from the bars. Bicycle Accident on Highway 12 in Kill Devil Hills, NC - We represented the family of a young man who was struck and killed by a taxi. The decedent was twenty-five years old and had been drinking at a bar. He left the bar on a bicycle and apparently fell into the travel lane on Highway 12 in Kill Devil Hills, North Carolina. A taxi came along shortly thereafter and ran over him, killing him. We were successful in bringing a claim against the driver of the taxicab under the legal theory of "last clear chance" and were able to make a recovery on behalf of the decedent's family. Bicycle Accident in Elizabeth City, NC - We represented a young man who was riding his bicycle in Elizabeth City. He ran over a storm drain which caused the entrapment of his front wheel and threw him off his bicycle. He suffered a shoulder injury and had to undergo surgery. This was a novel case for our practice, but after our investigation, we determined that the storm drain was not a "bicycle friendly" storm drain and that the state of North Carolina was responsible for the upkeep and maintenance of the street. We brought a state tort claim under the North Carolina Tort Claims Act against the North Carolina Department of Transportation. Through discovery, we obtained the state's entire file on storm drains in Elizabeth City in reference to bicyclists. These files showed that the North Carolina Department of Transportation had previously done a study in Elizabeth City and had determined that these storm drains were dangerous for bicyclists, but had not fixed them. Medical Malpractice, Misdiagnosis - We represented a young man who went to the emergency room complaining of swelling in one of his testicles. He was diagnosed with an infection and sent home with medication. He was later seen by another physician who correctly diagnosed his condition as Testicular Torsion which ultimately caused the loss of his testicle. We brought a medical malpractice claim against the urologist who had originally misdiagnosed him and settled the case after mediation. Medical Malpractice, Nursing Errors - We were successful in bringing a claim against Albemarle Hospital located in Elizabeth City, North Carolina for the family of a lady who died while in the hospital. The decedent had been suffering from significant respiratory problems. She had been left unattended for a number of hours and was later found dead. We were able to prove that nursing errors had caused her death. Premise Liability, Fall From Deck in Nags Head, NC - We represented the family of a young man who fell from a deck at a cottage in Nags Head, North Carolina, hitting his head on the pavement which led to his death. We were able to prove that the railings on the cottage were defective and did not prevent him from falling through. After extensive discovery we settled this case. Products Liability, Faulty Boat Steering Mechanism - We brought a lawsuit in the United States District Court on behalf of an elderly gentleman who was driving a bass boat in the local waters. The steering mechanism of the outboard engine failed which threw him from the boat and caused him severe neck and shoulder injuries. We brought the claim against the manufacturer of the outboard motor alleging that the steering mechanism of the motor itself was defective. We employed a metallurgist and other engineering experts to support our claim. 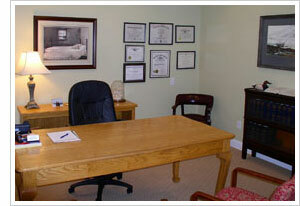 We took a number of depositions and conducted extensive discovery. The case was tried in the United States District Court for the Eastern District of North Carolina. After two and a half days of trial, the manufacturer of the outboard motor agreed to settle the claim. Products Liability, Defective Design - We represented a teenage girl whose foot was severely injured while moving a volleyball stand at her high school. The upright pole of the stand separated from the base, the base landed on her foot, cut through her tennis shoe and crushed her foot. We filed a lawsuit against the Texas manufacturer. We took depositions in Texas, Colorado and North Carolina which proved the volleyball stand was defectively designed and the manufacturer knew of its defects. The case was settled. Products Liability, Scuba Diving Accident - We represented the family of a man who died from defective scuba diving equipment. The man was a certified diver. He rented the equipment from a local dive shop in the Outer Banks of North Carolina. We were able to prove that the defective equipment led to his death. The case was tried in the United States District Court for the Eastern District. The case settled after a three day trial. Workers' Compensation, PTSD - We represented a number of police officers who suffered from Post Traumatic Stress Disorder for conditions caused by the previous chief of police. The cases were settled after mediation. Workers' Compensation, Leg Injury Resulting in Death - We represented the widow of a man who suffered an injury to his leg while employed by a local business. He underwent surgery and died several days later from an embolism. We brought a Workers' Compensation claim on behalf of the widow. We were able to settle the matter in excess of the statutory benefits because we were successful in proving that the widow was also disabled, which would entitle her to lifetime benefits. Workers' Compensation, Back Injury - We represented a man who worked for a water treatment company. He suffered a back injury while delivering salt to customers. Initially, his claim was denied. We took the case through a hearing in the Industrial Commission and subsequently to the Full Commission of the Industrial Commission where we obtained an award on his behalf. In addition to collecting the wages and medical bill payments from his original claim, we also secured future medical benefits for his ongoing back problem. Civil Rights Violation, Illegal Search - We represented a teenage girl who was subjected to a traffic stop and strip-searched at a police department. The police officer claimed that she was under suspicion for possession of drugs. It turned out that there was no probable cause to either stop her or to conduct the strip-search. We were successful in bringing a claim against the police department and the matter was settled after mediation.